Read our latest news, download publications and see which events we will be attending. Lévis, Quebec, 26 December 2017 – Davie Shipbuilding – Canada’s leading shipbuilder – today announced that it has completed the construction, commissioning and sea-trials of the first Resolve-Class Naval Support Ship, Asterix. The ship was delivered on time, to budget and most importantly, at an internationally competitive cost. The ship departed Québec City 23 December 2017 en-route to Canadian Forces Base Halifax where she will enter service with the Royal Canadian Navy and be operated by Federal Fleet Services Inc. Her crew of 36 Canadian merchant sailors together with Davie personnel and industry contractors sailed the 26,000-tonne ship on her maiden voyage. During the journey, they completed the testing of her propulsion and navigation systems and state-of-the-art military systems. Upon arrival in Halifax, the ship will welcome aboard members of the Royal Canadian Navy to begin integration training during the month of January 2018 prior to supporting Canadian naval operations from February 2018, for the next 10 years. The delivery of Asterix represents the first new naval support ship to enter service with the Royal Canadian Navy in over 50 years. It is also the first large naval platform to be delivered from a Canadian shipyard in over 20 years and the first naval ship to be delivered since the launch of the National Shipbuilding Strategy. “The delivery of this ship is an innovation showcase for Canadian industry and marks an important new era in Canadian maritime power, for it once again allows the Royal Canadian Navy to independently deploy globally for combat, peacekeeping and humanitarian operations. To see the Resolve-Class as just another naval ship is too simplistic. 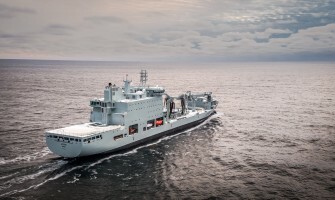 It is truly a force multiplier which will provide a globally deployable operating base for the Canadian Forces,” said Spencer Fraser, CEO of Federal Fleet Services Inc. The Resolve-Class Naval Support Ship, Asterix, was designed by Rolls Royce to meet the highest and most stringent of NATO and Lloyds Register requirements to support military operations, specifically for its primary Replenishment-At-Sea functionality but also in terms of systems redundancy, damage control, ammunition storage and other systems onboard. “This is a proving point for Davie. When we began this program, we looked at what DND had been planning with the Joint Support Ships since 2005 and we quickly realized that the 26-year old German design could be improved upon. For example, having only two replenishment-at-sea stations would mean that it does not fully meet the latest NATO requirements, which crucially calls for four stations. So, we set out to build an innovative, modern design of a naval support ship with the latest, state-of-the-art systems that would be fully compliant to meet Canada’s international and NATO commitments yet also provide a purpose-built platform for responding to humanitarian crises. We wanted to deliver a ship which would rival or exceed the best of the world’s naval support ships. Working closely with our partners in the RCN, the Canadian government and Canadian industry from coast-to coast, we can state categorically that we achieved our goals today,” commented Alex Vicefield, Chairman of Davie Shipbuilding. The construction of Asterix was entirely privately financed; whereby for the first time in modern Canadian procurement history, all the technical and financial risk was borne by the companies involved – Davie and Federal Fleet Services. Unlike other current marine projects, the Canadian taxpayer has not been asked to pay a single cent until the ship is ready and able to meet the needs of the RCN. IHS Markit (Jane’s), the leading global naval and defence analysis firm, assessed the Resolve-Class Naval Support Ship to be, in all respects, on a par with the world’s best naval support ships. The Resolve-Class Naval Support ship took 24 months to deliver and employed over 1000 Canadian shipbuilders at Davie and provided contracts to 918 Canadian suppliers across the country. Following common practice, also adopted by Canada’s key allies including the US Navy and Royal Navy, the vessel was converted using the hull from a modern, high quality and ice-strengthened containership. During the conversion, the ship was stripped down to its keel and rebuilt in a modular fashion, installing the same key Canadian military systems that will be installed on Canada’s future naval fleet such as OSI of Vancouver’s Integrated Tactical and Navigation System, L3 MAPPS of Montreal’s Integrated Platform Management System and Hepburn of Toronto’s Replenishment-At-Sea Systems. Other innovative features include an extensive intermodal handling area that is accessible at sea (a first within NATO), Canada’s first at sea hospital facility (with a full operating theatre) and an advanced aviation capability which is able to land all of the RCAF’s helicopters (including Chinooks). A fully redundant electrical power plant and propulsion system were also installed to preclude the possibility of a recurrence of a complete power plant failure that struck HMCS PROTECTEUR in February 2014. Asterix will also be the Canadian Government’s most “Green Ship” and features, amongst other environmental innovations, Terragon of Montreal’s MAGS 8 waste management system. Like the Joint Support Ship, the ship is capable of being fitted with a range of active and passive self-defence systems, including three Raytheon Phalanx 20mm Close-In Weapon Systems. The ship will remain under the ownership of Federal Fleet Services and be operated by a mixed crew of Canadian merchant seafarers and Royal Canadian Navy personnel for at least the next 10 years. The ship has a service life of 40 years. termination of the lease. At a value of $659m today, Asterix’s price is a fraction of the cost of the currently planned Joint Support Ships (2013 PBO estimate indicates a 50% probability that each JSS will cost over $2.1B each). While Asterix remains under the ownership of Federal Fleet Services, it will fly the company’s House Ensign and be referred to as Motor Vessel Asterix. Davie and Federal Fleet Services fully support the government’s new defence policy – Strong, Secure, Engaged – which calls for at least two naval supply ships, though most naval experts would agree that Canada requires four such vessels to simultaneously ensure availability on both coasts, form international task groups and provide redundancy during maintenance periods. Due to program delays and limited shipbuilding capacity under the National Shipbuilding Strategy, the first Joint Support Ship will likely not be delivered before 2026 at the very earliest and possibly as late as 2028. As such, Davie has offered to build a second Resolve-Class Naval Support Ship for the Royal Canadian Navy in order to mitigate the need for Canada to rent supplementary ships from the Chilean and Spanish navies over the next decade. Federal Fleet Services supports military, government and humanitarian operations through the construction, ownership, servicing and management of complex, mission-critical ships. Federal Fleet Services is the Canadian At-Sea Support Services Provider, providing a fully operated Naval Support Ship for the Royal Canadian Navy from 2017. Federal Fleet Services is part of the Inocea Group of Companies which also owns Davie Shipbuilding Canada’s largest and highest capacity shipbuilder. Davie is Canada’s largest, highest capacity and most experienced shipbuilder. In 2015, Davie won the prestigious title of Lloyds List North American Shipyard of the Year. Over the past five-years, Davie has generated over $2bn in economic benefit to Canada and directly and indirectly employs over 3,000 Canadians, including over 1,400 who work at the shipyard in Levis, Québec. Davie has been Canada’s shipbuilder and ship-repairer for every class of major naval platform over the past century. Today, Davie is an industry leader in icebreaking, LNG and dynamic positioning technologies as well as naval and other mission-critical shipbuilding. Davie is ISO 9001:2015 certified for Quality Assurance and ISO 14001:2015 for Environmental Management. End-to-end solutions for complex build projects, on and offshore. Davie is more than just Canada’s largest shipbuilder. We provide value-added, specialized products and services where we leverage our high-capacity fabrication capabilities to provide complex, engineered solutions to meet our clients’ needs. Our capability to provide end-to-end turnkey solutions as well as our strategic location makes Davie the partner of choice for clients across a broad range of industries from offshore oil & gas to defense. ©2013 Chantier Davie Canada Inc. All rights reserved.